We’re based in the heart of Bury St Edmunds in Suffolk, a county where agriculture is a major part of the economy. A large part of our landscape, similar to many other rural communities, consists of farmland, leaving a limited amount of space for housing developments. So, with a growing population, how do we handle the rising housing demands in rural communities? This is where Class Q permitted development rights come in. What are Class Q permitted development rights? Permitted Development Rights generally enable property owners to carry out certain types of works to their property without needing to go through the full process of obtaining planning permission. Introduced in 2014, Class Q of the General Permitted Development Order applies this to agricultural building conversion. This covers the conversion of all agricultural buildings, including barns or even chicken sheds and modern grain stores. What changed for Class Q permitted development rights in 2018? Up to five smaller dwellings, each with a floor space of no more than 100 sqm. Up to three larger dwellings, with a maximum combined floor space of 465 sqm. A combination of the two, where up to five dwellings can be created, of which no more than three can be larger dwellings. Class Q provisions are not permitted in national parks, conservation areas or Areas of Outstanding Natural Beauty. You’ll also need to seek prior approval concerning flood and contamination risks, impact to transport and highways, and changes to the external appearance of the building. Be prepared that you may still receive a rejection from the local authority if they do not feel that your conversion ticks all the boxes. Furthermore, as the Class Q provisions are limited to the dimensions of the existing building, the order does not permit extending beyond this limit. So if your intention is to convert and extend, this will mean having to submit an application to your local planning authority. If you’re thinking about purchasing a rural property, be aware of agricultural user restrictions, also known as ‘agricultural ties’. This is a planning condition which restricts a building to agricultural use only, and this may not be obvious without a local search or by contacting the local planning authority. Usually these are in place where development is unlikely to be carried out, such as on a farm. A common scenario may be where a dwelling has been built for a farmer’s son or daughter, who intend to work on and inherit the farm. The planning consent may be granted, but it would be restricted to that particular type of occupant. It is possible that a building which has not been used as part of a farm for many years may still be subject to an agricultural tie, purely because it was originally constructed for use as an agricultural building. Therefore, you should be mindful that a restriction may exist when purchasing a rural property. While there are many different types of buildings present on agricultural land, barns are one of the most popular for converting to a dwelling. Barns are often full of character, reflective of their history, and much of the time built using local materials. Most barns in the UK can be divided into three architectural categories: a ‘box construction barn’ consisting of the four external supporting walls; a ‘pot and truss barn’ which features an internal timber frame adjoined to vertical posts to take the weight of the roof; and a ‘cruck framed barn’ in which the walls, along with the internal timber A-frames, support the roof. It takes a great deal of work to convert a building which was purpose built to provide shelter for animals, or to store equipment and produce, into a comfortable living space. However, the scope for creativity is immense, and the process can breed spectacular results, both functionally and aesthetically. An extensive project such as this benefits from the advice of an architect, whose expertise will be invaluable in helping you overcome potential obstacles along the way. We can advise on all aspects of the conversion, including plumbing and sanitation, electricity, access and layout, through to window placement and fixed lighting. To a modern architect, as well as your local planning authority, the two main concerns in the conversion of agricultural buildings are sustainability and impact to the local environment. With a barn conversion, it’s important to reduce the visual impact on the environment, so that the building does not look out of place with its surroundings and maintains the rural charm that only exists in buildings of this type. You may find that barns in rural areas are old and possibly listed. Listed buildings are subject to strict planning rules, and require careful consideration when it comes to altering their appearance. However, even if the barn is fairly new, it’s unlikely that the local authority will accept any radical changes which do not adhere to the local image. It’s also essential that conversions make as little impact as possible to the wider environment. Common choices include installing renewable energy systems, such as solar panels. In addition, using local materials where possible will both reduce mileage and make it easier for you to repair or replace materials if necessary. At Whitworth, we have years of experience in planning and managing barn conversions both in Suffolk and the surrounding areas. We are happy to offer our expertise and services to anyone considering taking on a project of this type. 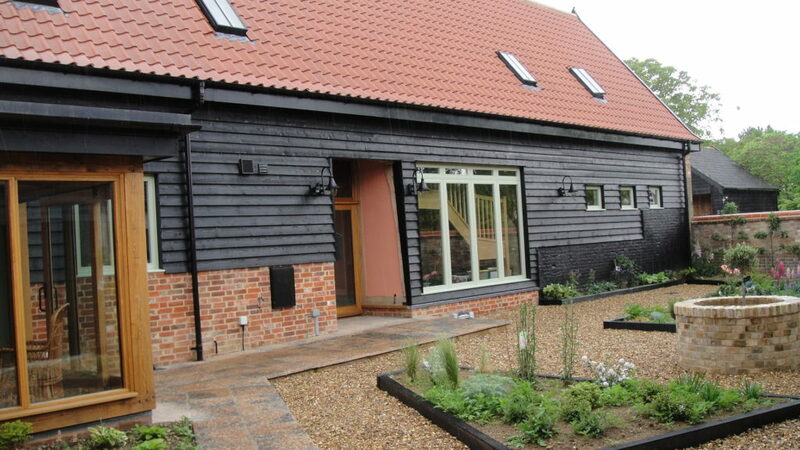 Here’s a look at some of our barn conversion work. The building on this property was classed by the local authority as a non-designated heritage asset, which required careful consideration in itself. The converted building now comprises three structures: a fully repaired timber frame barn that remains a single space; a brick dairy which houses three bedrooms, a bathroom and an en-suite; and a contemporary barn structure at the centre of the house which features a kitchen, living space and master bedroom. Requiring extensive structural and remedial repairs, this building was transformed into two semi-detached homes, one three bedroom and one four bedroom. Both homes retain a large amount of the original timber frame from the barn. The new homes have solar thermal panels, air source heat pumps and heat recovery systems throughout. In a project featured on Channel 4’s Grand Designs, we carried out a sensitive conversion of this barn and guildhall, which was revealed to be the oldest in Suffolk. Traditional methods were used to retain the integrity of the original property, while extending the life of the building for years to come. Find out more about this post here. If you are thinking about purchasing a barn for conversion, or any other type of agricultual building, contact our team of chartered surveyors who will be able to help you make informed decisions regarding the property. Finally, don’t hesitate to get in touch with our architects, who are on hand to help you achieve the barn conversion you’ve always wanted. Call us on 01284 760421 or visit our contact page here.